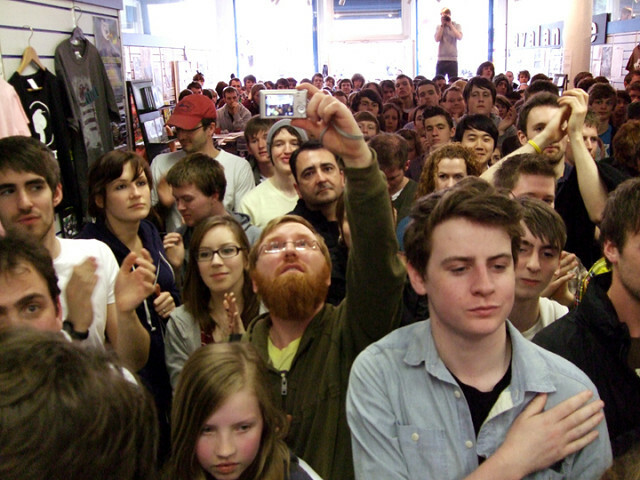 What a day of brilliant live music to celebrate REAL record shops. First along with hundreds of others I queued in the Grassmarket for two hours to get into Avalanche to see Scotland's hot product Frightened Rabbit. They were brilliant as usual and kept everyone happy doing signings etc. well after the set despite having to hot foot it over to Glasgow for another set at Monorail at 5pm. My Frightned Rabbit pictures are here. Then things calmed down a good deal as Gordon McIntyre of indie royalty Ballboy performed a great solo acoustic set including numerous new songs which will hopefully feature in the next album due in Autumn. Photos of Gordon's set here. Finally, for me at least, next door into Red Dog Music for The Last Battle's set. TLB are another great Edinburgh band and deserve some great exposure. Get hold of their album. My pictures of The Last Battle's set here.